I really LOVE starburst mirrors. Look at the one I made in December. Anywho, I wanted to make another one, especially after I saw this one: After studying the mirror, I discovered I needed three metal rings and some metal rods. Where can I get three rings? Answer: A TOMATO CAGE. I made- I mean asked nicely- if Matt would cut up the tomato cage so I could have my three rings and be on my way to creating a masterpiece. My Three Rings...Now where to get small metal rods? I used the metal stuff left over from our drop down ceiling home improvement project. I cut the long rod into small rods. Arranged a pattern around the rings. Since fire scares me, Matt soldered the rods onto the rings. The next day, I spray painted the body silver, to cover the burn marks and discolorations. I was going for this look, but After hot gluing my mirrors on, it turned out like this. 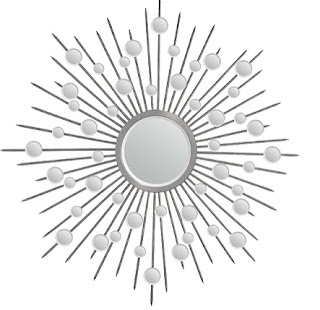 I didn't like the look of it, so I went web surfing and found this mirror. I took most of the mirrors off, and followed- as best I could- the pattern above. I must say it looks much much better. Wow, this looks awesome. I would have never thought to use a tomato cage. Where did you get the little mirrors? I really think I need to make one. Just scared b/c all my stuff lately looks homemade and cheesy so I am a LITTLE intimidated. 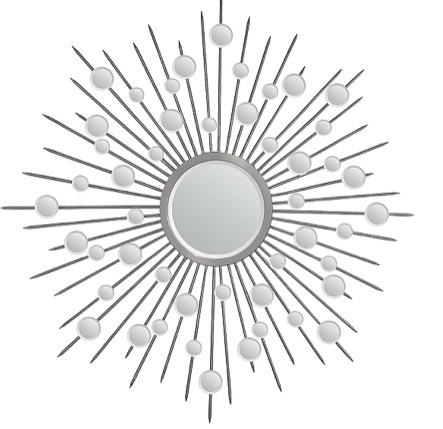 You can get little mirrors at any craft store- Roberts, Hobby Lobby,Joann's- possibly Wal-mart. wow!!! I love it!! I still want to make one like your first one! will you help me? This is amazing! You made that from a tomato cage! Genius!!!! I will feature this at somedaycrafts.blogspot.com tomorrow evening! Grab my "featured" button. Hi, saw this at the DIY Show Off and had to stop in. So creative! I see these everywhere (and they're so expensive too!) I don't think I'm quite ready to try it myself yet. Yours looks fabulous! Popped over here from Motivate me Mondays! WOW what a great idea!! I love how it turned out! Great idea! 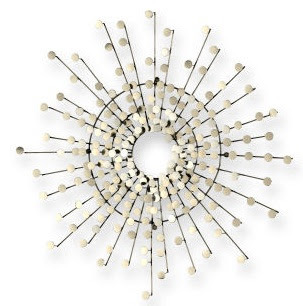 I am busy gathering ideas to make several different types of sunburst and wall mirrors to add to our screen in porch. Thanks for a great one! you're so clever... well done! would you like to follow me back? have a nice day! That is so cool. I love it. Very inspiring. I'm going to have to try this. Looks great! Wow, from a tomato cage, I never would have thought of that! This project got the most hits at this week's Mad Skills party, so I am featuring you on my blog this morning! Grab a brag button for your sidebar if you would like one! Now that's just amazing! I'd never have thought of it. Thanks for linking to my blog hop. Thanks for linking up! I featured your idea! Come grab a featured button! that is just WAAAY too much talent for one person! you did great! a tomato cage? I am so impressed. this will be enough amazement to last me all week. Just found this on Sumo's Sweet Stuff. What a cute idea. Think I may have to steal one of my hubby's tomato cages. I have wanted to make one for my daughter's room for a while. Thanks for the inspiration! That is just crazy cool. That looks so cool, and such a clever use of materials! Oooo! I like that mirror too. I like that you used a tomato stake-- way to shop the hardware store for something soooo feminine! This is so cool, so creative, I have to try it. Thanks for sharing! !